Capcom's celebrating 30 years with glasses featuring Mega Man, Phoenix Wright, Resident Evil, and Ghosts'n Goblins. Capcom has a 30-year history, and one of its most beloved series is Mega Man. For the anniversary, the company is making memorabilia, one of which is glasses. 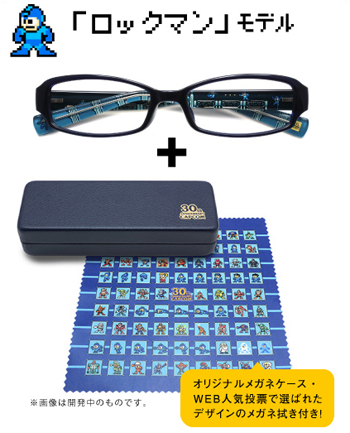 Sold through Zoff, a Japanese eyeglasses company, glasses feature Mega Man, Phoenix Wright, Resident Evil, and Ghosts'n Goblins. While they look like unassuming plastic frames on the outside, the inside part of the frames feature characters drawn in the Mega Man style. The Mega Man glasses are black on the outside and blue on the inside, showing Mega Mans fighting. Platformer Ghosts'n Goblins, red and black, shows characters drawn in the same style as Mega Man, as are the characters from Resident Evil and Phoenix Wright on their respective eyeglasses. The characters from Resident Evil each occupy a white circle and hold guns. One end of the glasses reads "Biohazard." Defense attorney Phoenix Wright and prosecutor Miles Edgeworth point aggressively, no doubt shouting "Objection!" at each other. Each pair of eyeglasses also comes with a stylized cleaning cloth for each series. Each glasses case reads "30th Anniversary Capcom." Zoff sells the glasses for 5,250 yen, roughly $52, but corrective lenses will cost more. Zoff is also only located in Japan. The glasses are a Zoff-online exclusive, and fitting them is free of charge at a Zoff store. Getting prescription lenses costs a fee at the Zoff store.